Century mdl. 2H12 ¼” x 12’ Hydraulic Power Shear s/n 2C024 w/ Power Back Gauging, 120” Squaring Arms on Each Side, Front Material Support, Foot Control. 6” x 6” x ½”, 4” x 4” x 3/8” Angle and “T” Shear Cap, 2 ¼” x 4 ¼” x ½” Coping Notcher, 1 3/16” x ¾” Punch Cap. Kingsland mdl. J.18 Type A Ironworker s/n C8671 w/ ½” Plate, 4 ¼” x 5/8” Bar, 8” x 5/16” Bar Shear Cap, 1 ¼” Round and Square Bar Shear Cap, 3 ½” x 3 ½” x ½” “T” Shear Cap, 5” x 3 ½” x 3/8” Angle Shear Cap, 1 1/8” x ½” to 5 ½” x 1/8” Punch Cap. Reed mdl. BR604 5/16” x 48” Initial Pinch Power Roll s/n 54152 w/ 6” Rolls. 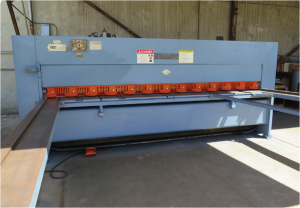 Chicago 15 Ton x 48” Mechanical Press Brake w/ 48” Bed, 6” Throat. 33” x 60” Acorn Forming Table w/ Anvil. Marvel mdl. 8-MK-1 Series 8 Mark I 18” Vertical Miter Band Saw s/n 820354 w/ Manual Clamping, 45 Degree Miter Capability, Coolant, Conveyors. 1997 Imet KMT Sirio 350 12” Miter Cold Saw s/n 971367007 w/ 2-Speeds, Manual Clamping, Coolant. American Hole Wizard 9” Column x 48” Radial Arm Drill s/n 72830-52 w/ 50-1500 RPM, Power Column and Feeds. Red Arrow mdl. RA-150 20 Ton Hydraulic H-Frame Press s/n 102135. Clausing mdl. 1771 Pedestal Drill Press s/n 523756 w/ 330-4000 Dial Change RPM. Delta mdl. 20-400 Pedestal Drill Press s/n 1354145 w/ 5-Speeds. Rockwell/Delta 6” Pedestal Belt Sander. SpeedAire 10Hp Horizontal Air Compressor. Baylor-Beall 5Hp Vertical Air Compressor. Miller Syncrowave 250 CC-AC/DC Arc Welding Power Source s/n KB159755. Miller CP-300 CP-DC Arc Welding Power Source s/n HK250969 w/ Millermatic 30E Wire Feeder. MillerCP-300 CP-DC Arc Welding Power Source s/n HJ156254 w/ Millermatic 30E Wire Feeder. Miller CP-200 CP-DC Arc Welding Power Source s/n HH096136 w/ Millermatic 30E Wire Feeder. Lincoln Idealarc TM-300/300 AC/DC Arc Welding Power Source s/n AC388903. Miller Dialarc 250-AC/DC AC/DC Arc Welding Power Source s/n HK272798. Thermal Arc PAK5 Plasma Cutting System s/n C32133A18183H. Track Torch Burner w/ Track. 60” x 72” Burning Table. Welding Clamps, Bar and C-Clamps. Milwaukee and Bosch Angle Grinders. Enerpak 30 Ton Hydraulic Bottle Jack Tapmatic Tapping Head. Rigid Pipe Dies and Handle. Lincoln mdl. 7015 8 Ton Cap 4-Post Car Lift. Jet 1 Ton Electric Hoist and Trolley.